Here at Baby & Children's Mattresses Online we have all types of mattresses to fit any make or model of bunk bed. We specialise in making any bunk bed mattress. We will be pleased to help you choose a mattress for your child's bunk bed. 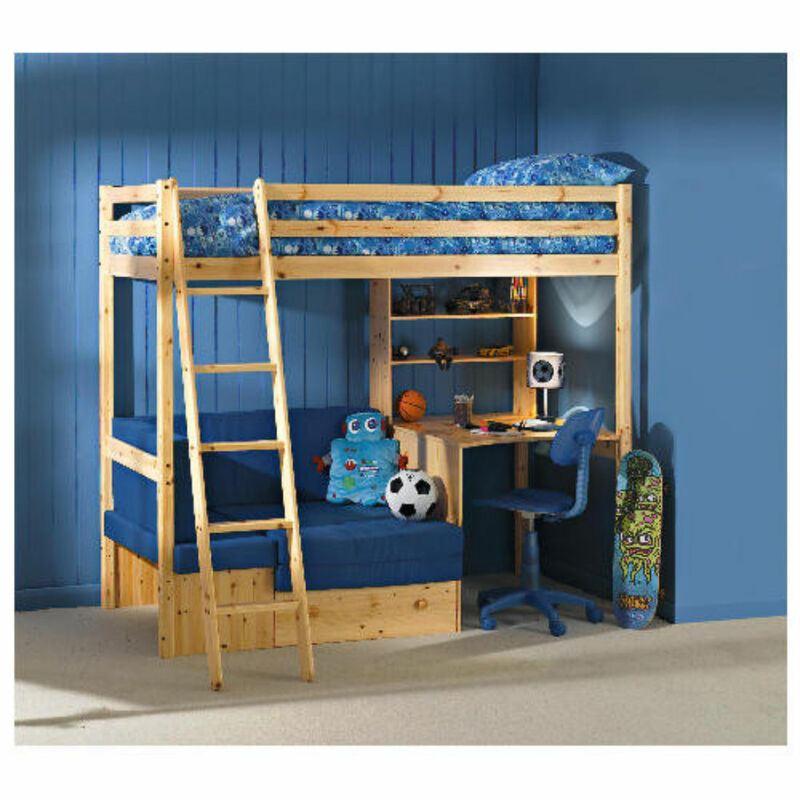 Bunk beds are a convenient and space-saving choice of bed, and many children enjoy climbing a ladder to reach the top bunk. But the very nature and design of bunk beds comes complete with potential dangers, and anyone using bunk beds in their home needs to be aware of safety issues. A bunk bed consists of a two-tier bed sleeping system, where a single bed (usually) resides on the bottom and another matching bed is cleverly raised above and joined together on a wooden frame. This nifty form of bed allows two people to essentially sleep in the same amount of space that one bed would normally take up. In homes where space is limited, using space vertically in this way helps considerably, and they are usually used in residential settings as a bed for children. When you’re choosing and purchasing a bunk bed, it’s important to look out for products that are very well made (usually from wood), are solid in their construction, and that conform to safety standards. Bunk beds sold in the UK need to conform with the British Safety Standard number BS EN 747:1993 (in the past, this was BS 6998:1998). No gaps anywhere that are less than 60mm or more than 75mm. The gap that allows access to the top bunk must be in the safety barrier on one of the long sides of the bed and needs to be a minimum width of 300mm. Guard rails need to be in place on each side on the top bunk. The ladder needs to have treads at least 3cm wide and 20cm apart. The gaps between the slats underneath the mattress needs to be no less than 7.5cm. The mattress needs to be at least 10cm below the top of the guard rail and needs to fit snugly and securely. Most bunk beds need to be assembled by the buyer and, if that’s you, you’ll need to ensure that you follow the instructions completely and produce a secure and safe bunk bed at the end. Make sure that the guard rails are fixed to both sides of the bed, especially on the upper bunk bed, so a child can’t inadvertently fall out. Although in the past some ladders may have been made detachable from the bed, they should be firmly fixed in place as a permanent fixture. If they sway or move when a child is climbing up or down, then this is not good – they should be solid and stable. Before children use the bunk bed, the importance of safety issues should be explained to them. It’s also helpful to put a few rules and regulations in place, regarding safe use of the bed, such as no leaning over the upper bunk (to prevent falls) and no playing on the ladder. Safety guidelines suggest that the upper bunk should not be used by children under the age of six years old. We are probably the most specialised place in the UK to order a bunk bed mattress. For more assistance on children's mattresses simply give us a call, email us or search more on our baby or children's mattress website.